As local Police Departments require Occupiers to spend longer periods awake and less connected to each other, the Occupiers come in contact more often with working, tax-paying people; contributing members of society. Unfortunately, these interactions sometimes end badly for the under-fed Occupiers. Occupiers apparently subsist on a primarily vegan diet, leading to an over-all weakened physical condition. encampments to school. Thanks to grants from OccupyBawlStreet.com, local Fire Departments have begun spraying Occupiers with an anti-baterial foam to improve public safety by preventing the spread of contagions and cooties. OccupyBawlStreet.com volunteers provide “stupidity-free-zones” where large numbers of nine-to-fivers come outside to rest and eat during their lunch hour. The volunteeers then facilitate the transfer of leftover, un-eaten lunches to homeless folks that Occupiers STILL won’t share their donated food with. 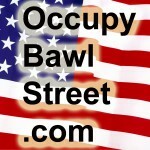 OccupyBawlStreet.com has also funded homeless peoples “Passive Security Training” sessions so the homeless can protect their few food sources from the foraging Occupiers. Furtunatelty for our homeless friends, cold weather seems to drive the Occupiers back to their REAL homes thus decreasing the competition for scarce food supplies. Sadly, homeless folks are still homeless in the cold weather and OccupyBawlStreet.com volunteers encourage the homeless to seek warmth in local shelters and supports clothing drives to help these poor folks survive the winter. to relocate hundreds of these germ-laden Occupiers away from clean members of society, diverting the Occupiers and helping to keep contributing members of society safe. OccupyBawlStreet.com reporter “Shallow Esophagus” is currently embedded with one team of scientists/reasearchers/mental health professionals from this Federal/State Government program which is tranquilizing, tagging and relocating Occupiers to less populated areas. The program reportedly had its genisis in a program from years ago that studied the migration patterns of “Dead-Heads” (People who followed the Grateful Dead from show to show). The data collected in that earlier study is proving most useful as “Dead-Heads” seem to be a subset of the Occupiers. We hope to post a report on this program in the coming weeks. Please feel free to comment or share this news with interested parties. This entry was posted in Society, Humor-Parody and tagged occupy bawl street, occupy wall street, occupy movement, NYC, NYC homeless, NYPD, Protecting working Americans, Occupiers, Federal, State, Government program, tranquilizing, tagging, relocating Occupiers, less populated areas, satire, sarcasm, comedy, funny by obs. Bookmark the permalink.